The top one's the 255 DOHC that I already posted, the centre one is the DFX (or it will be a DFX...) that's going in the Lotus 71 Indy car, and the bottom one is the Ford Cammer that will go in the dragster. There's a lot of work to be done on the lower two before they're installed though. The DFX needs to be turned round 180 deg. as the real one drove forwards to a transfer 'box as the car was 4WD, but the turbo housing will still have to be behind it. No, I haven't figured out how do to that yet. The big Cammer engine will need its gearbox sawn off the rear and a big blower and manifold installed on top. Are you using the Lotus 63 layout as your starting point, rather than the 56? I'm going where the build takes me actually. The existing exhaust headers in the Lola engine Chevy won't fit in the 56 body shell as it stands, but all the piston engined 4WD cars had the Cosworth engines reversed so the drive was taken from the front. Sadly any that had turbos, only the Indy cars, all seemed to have the turbos at the rear. 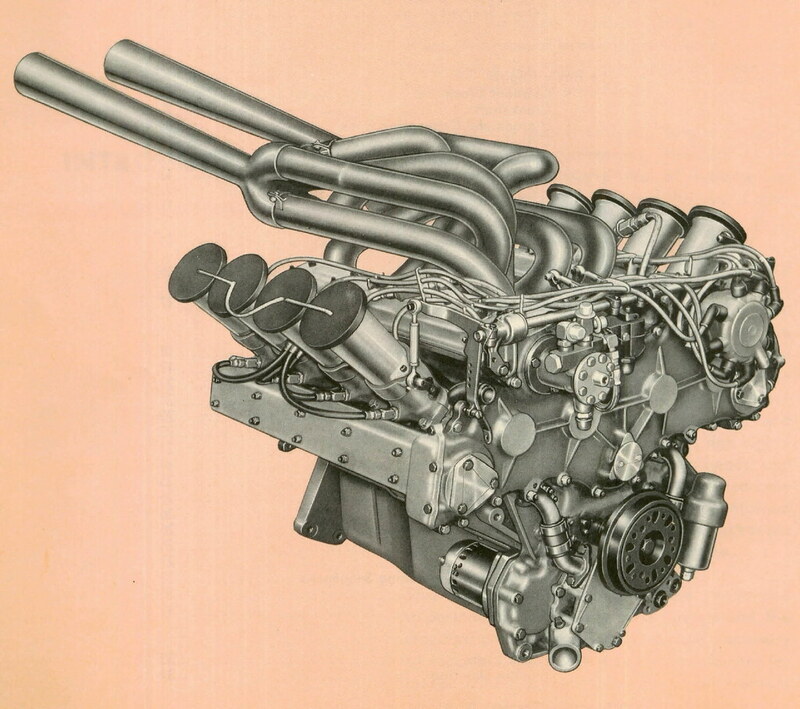 Yes, that 'Chrysler' engine does look like a very badly plumbed Ford 255, doesn't it? The shape of the cam covers is very distinctive. Your third pic down is interesting, as it shows very similar plumbing to the Crombac pic, but with the intakes turned through 90 deg around their longitudinal axis. 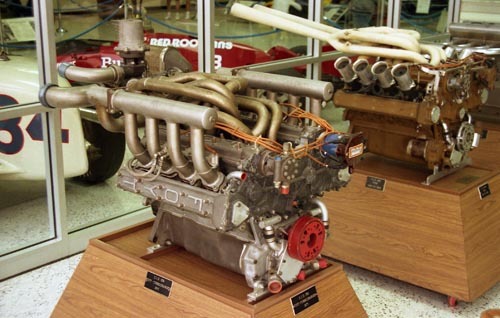 I don't know much about the Foyt engine, but it looks very like a Ford 255. Is this your way of saying "making it up as I go". ...Yes, that 'Chrysler' engine does look like a very badly plumbed Ford 255, doesn't it? The shape of the cam covers is very distinctive. When the pic was first posted I tried to find more details on Google, searching for Mopar engines but could find nothing else. This may explain why. 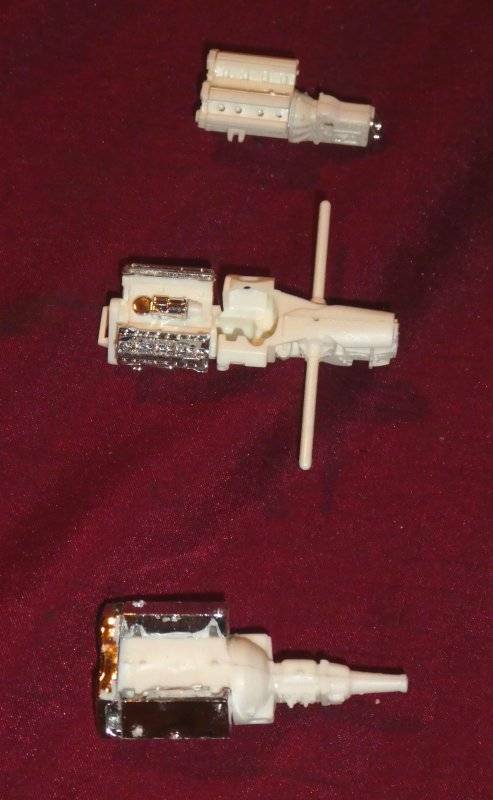 Third pic looks like they swapped the manifolds from side to side. Granatelli did run at least one of the Lotus 56s with a Plymouth engine, according to various sites, but I can't find a pic of it anywhere. It may have been a V6 too. Yes, I see what you mean about swapping the manifolds, I think I'll have to do something similar with the 'DFX' exhausts as they won't fit anywhere as they are. The Foyt is a Ford 255 with a little rebranding. a lower profile, good catch Fred. It all does give one things to get the mind wandering. With the flatter profile intake plumbing those outer tubes must have needed most of the 56's bodywork cut away. Art Pollard's turbo-Offy 56 only had the outer edges of the 56 left, but even they'd have had to be cutaway to handle that 'flat' intake pipework. The DFX engine had top intakes, fed from the turbo at the rear, with the exhausts feeding from the underside of each head around to the turbo at the rear. The problem with the Lola Ilmor engine that I'm having to use is that exhausts are much to wide to fit down into the 56's chassis, so I may have to 'imagineer' them so only the turbo end is visible. While trying to figure out how to get the 'DFX' engine to fit my Lotus '71', I thought I'd change tack to the dragster engine. It's an AMT Ford 'Cammer', which is in NASCAR form as it comes from the box, but it'll need a big GMC 6-71 blower and its manifold, a suitable blower drive, a dry sump oil system and some hefty exhaust headers to suit an AA/FD dragster. Logic says that the parts from the Tom McEwen dragster kit should work OK, except they come from a Chrysler Hemi engine and the kit is by Revell. With a bit of filing and cutting I got the 6-71 put together (the parts didn't even fit straight from the kit!) and with a bit more filing they fit the intake side of the 'Cammer', but the blower belt drive doesn't fit worth a LIGHT! It doesn't even fit the parts from the kit that it's MEANT to fit either! Luckily I have a box full of dragster bits and pieces and one of the belt drives has the correct pulley spacing to fit the hybrid Hemi/Cammer engine, and with the addition of a small spacer will work quite well. Pics when it's all dried later on. Got the main parts of the dragster engine assembled, but sawing off the gearbox was a bit of a pain. The rear end of the block will need some building up before I can glue on the rear engine mounting plate as its positioning is very important to how it all fits together. It'll need wiring and piping and lots of greebles and stuff of course. I also started on assembling the dragster frame, and I'd forgotten quite how flimsy those loooooong rear engine frames are! 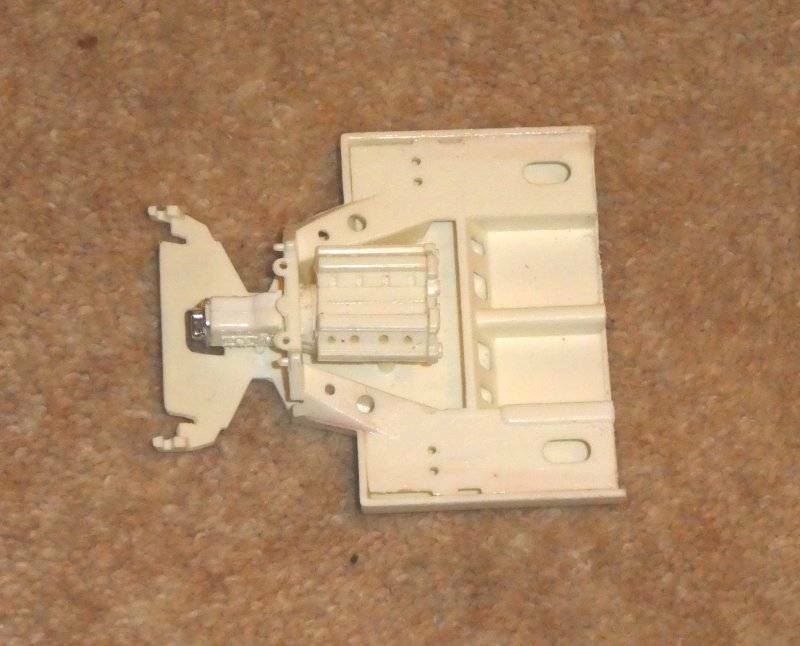 I may have to jig it up with BluTak or something similar before adding the other parts. Bit late now, but two layers of black electrical tape cut into the right width makes for a good scale blower belt. The moulded kit ones are always too thick. Pulleys from sections of rod or tube (or if you have a lathe... ). 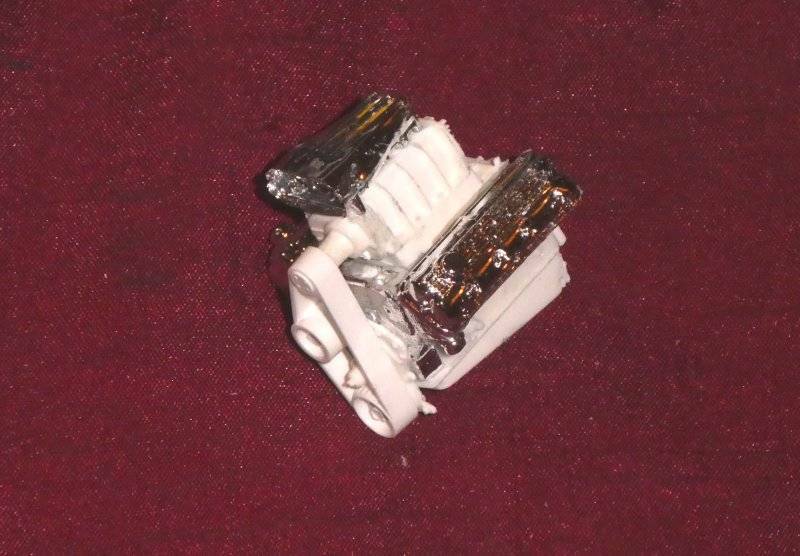 The AMT Hippy Hemi (which IIRC has the TV Tommy Ivo dragster kit as its chassis) has a chrome crank, clear sump and rubber band blower belt. 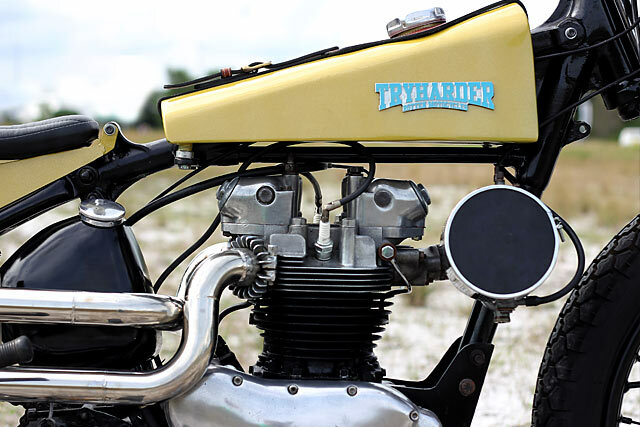 WRT out of the ordinary cylinder heads back in the late seventies/early eighties it became common in the UK to see custom bikes with the cylinder heads reversed. i.e. in the case of a parallel twin like a Triumph having the carbies on the front and the exhausts coming out the back. While this may have had its origins in drag racing (some ram air benefits from the front mounted carbies) on a street ridden bike I can't see it leading to anything other than overheating and a hot crotch/burnt legs. I think the main reason it got done on show bikes was trophy hunting. Back then UK custom car and bike shows were judged using a system where entries were awarded points in a number of categories - Paint, engraving, engineering, chrome, upholstery etc. If you wanted to win you had to score points in each section. Overall aesthetics, comfort, practicality and drivability didn't get a look in as they didn't score. A prime example of the breed is Jon Reeds Yamaha Virago built in 1982. It doesn't have reversed heads but it does have everything else including gold plating, a myriad of hand made parts and the then obligatory Don Blocksidge engraving on every metal surface. I did that tape belt trick on some of my earlier drag racing models, and it's not impossible to do it on the JPS rail even now. Looking at the engine with a view to wiring I realised I'd got the cam covers on the wrong sides, so the plugs were at the bottom, not the top! So out came the scalpel blade and a small screwdriver to lever them off and put them back on the correct side. If I can do that with the relatively vast gluing area that the cam covers had the blower drive belt should come off easily. What I don't have is a lathe of any sort, but previously I just filed down the kit pulleys, and that may work again. Work on the Racing Team will come to a halt for a while I'm 'touring' en route to Telford. But I expect I'll still be thinking of solutions to the myriad problems in building the Team. Actually it didn't, thanks to the generosity of my host and hostess tonight I was able to do some work on the tow truck for the JPS trailer. 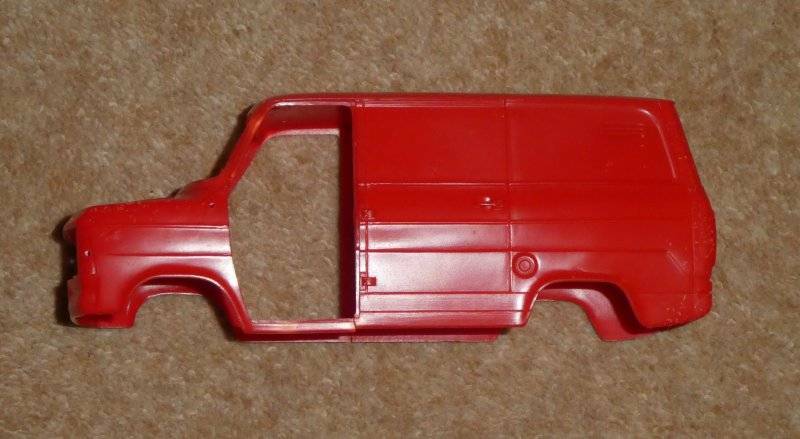 As I mentioned before it's based on an Italeri Ford Transit, as below. But it obviously needed some serious work to make it a pickup, so I sawed the back off. This didn't leave much strength on the structure, the B posts are only about 1 mm square, and sure enough a couple of pieces broke, the LH A post and the LH floor stringer. But I've glued in the rear cab bulkhead to strengthen it all up (after LOTS of filing to ensure it fitted!) and it's looking promising. The breaks are circled in green. Then I needed to fit the GT40 chassis under the Transit body, but the GT40's wheelbase is around 11" shorter than the Transit so the GT40 chassis needed to be sawn in half and lengthened. 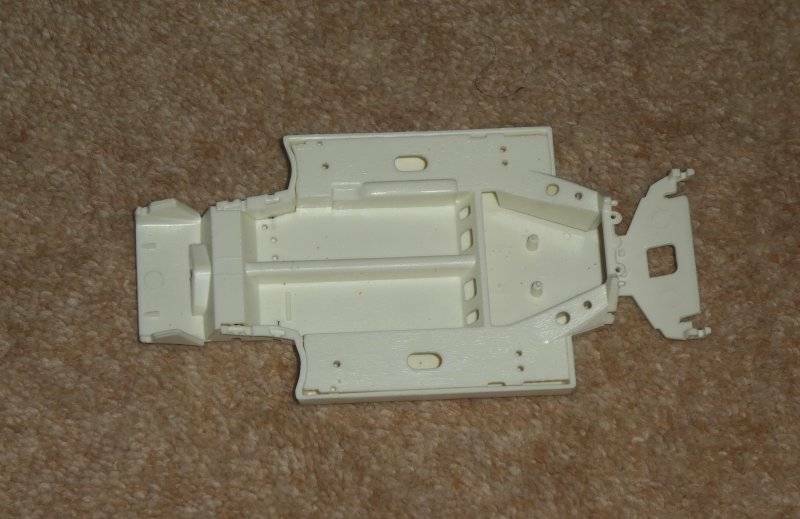 This is the original IMC GT40 underframe parts just slotted together. And this is it sawn in half with the DOHC engine in place. Yes I know, some purists will throw their hands up in horror at the thought of me sawing up a perfectly good IMC GT40, but I've built 2-3 of them already. The design of the GT40 chassis is such that you need to paint most of it before you can assemble the suspension and traction parts, which is a bit of a pain, so I slotted some of the rear suspension into place to check how it fitted into the Transit. Oh dear, the GT40 is also a LOT narrower than the Transit is, which makes me wonder how Ford built their Supavans, but I suspect they used a Mk II Ford GT as a basis, and they're a lot wider than the IMC kit. I've got a Mk II kit but it's destined to be built as the 1966 Le Mans winner, so something will need to be done. Wider tyres will reach out to the bodywork and you can bridge the gap between the GT40 chassis and the van shell with styrene sheet. 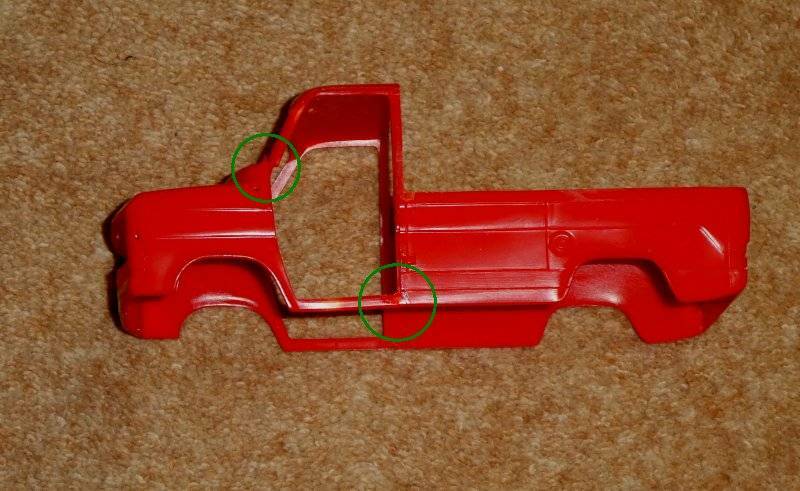 Use the front half of the van chassis including it's suspension.